Two girls saw a need in their community and then rallied their teachers and classmates to meet it. 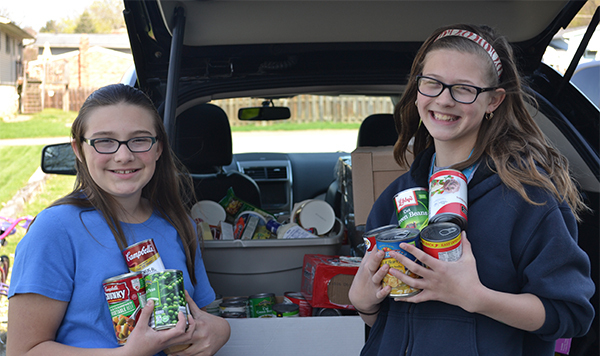 Fifth-grader Kaitlyn Williams of New Philadelphia First United Methodist Church (Tuscarawas District) and her friend, Amber Ward, held a food drive as a class project at Sandy Valley Elementary School. The girls are part of the school’s gifted students SOAR program – which is an acronym for Stimulating minds, On-going exploration, Achieving new levels and Rising to the challenge. After receiving permission to hold the food drive, the two 11-year-olds went to work making posters, writing announcements, and promoting the need for donations to the school’s third- and fourth-grade classes. The three-day food drive yielded 233 pounds of food, enough to provide 194 meals to those in need! The girls delivered the collected items to The Helping Hands Network, where Ward has previously volunteered. The organization operates a choice food pantry as part of its outreach program to residents of East Sparta, Magnolia, Sandyville, and Waynesburg – the communities that comprise the Sandy Valley Local School District.